National Oilwell Varco (NOV) and WMS Industries (WMS) "Trading Transparency"
I continue to work my strategy even in the face of this volatile market that was screaming higher at the close. The Dow closed at 9,065.12, up 889.35, and the Nasdaq moved up 143.57 to close at 1,649.47. The S&P also participated, moving up 91.59 to close at 940.51. I cannot guess when the market shall be moving higher or correcting sharply. All of the stocks I own I consider "great companies". But they do not always perform as I would like (move higher). I have changed my strategy when down to the minimum of 5 positions, as I have written about previously. I continue to try to have a minimum of 5 holdings, but I can tolerate a 16% loss, and after they hit that loss and are sold, I replace them with a smaller position. I actually now determine the average size of my remaining holdings and buy a new position at 1/2 that size as measured by the cost of the purchase---not the number of shares. Earlier today, before the last hour climb in the Dow, I sold my 210 shares of National Oilwell Varco (NOV) at $23.55/share. This stock has been travelling lower in synch with the price of oil. And no matter how pretty the numbers on this company, the price has been relentlessly declining since my purchase. These shares were purchased literally just days ago on 10/17/08, at a cost of $28.83/share. Thus I had a loss of $(5.28) or (18.3)% since purchase. No way around this, it had passed my 16% limit for a loss and was sold. Ironically, this stock rebounded later in the day to close at $25.49, up $1.99 or 8.47% today----but I hate that analysis. It is far more important to make decisions in the market than to kick yourself about decisions that might have worked out some other way. Back to four positions in my trading portfolio, I had a new 'permission slip' to be buying a stock. However, this purchase would necessarily be smaller, representing 1/2 of the average size of my remaining four holdings. Let's take a little closer look at WMS. First of all, what does this company do? "...engages in the design, manufacture, and distribution of gaming machines and video lottery terminals (VLTs) for customers in gaming jurisdictions worldwide. The company�s products consist of video gaming machines, mechanical reel gaming machines, and video poker gaming machines. It also sells spare parts, conversion kits, amusement-with-prize gaming machines, and used gaming machines, as well as equipment manufactured under original equipment manufacturing agreements to casinos and other licensed gaming machine operators." Yesterday after the close of trading, WMS reported 1st quarter 2009 results. Earnings camne in at $15.7 million or $.27/share, up from $11.1 million or $.19/share the prior year. This result exceeded expectations from analysts polled by Thomson Reuters who were looking for earnings of $.25/share. Revenue came in at $151.4 million, up 14% from last year's $132.5 million result. Again, this revenue figure exceeded expectations by analysts. The company reaffirmed fiscal 2009 guidance. Reviewing the Morningstar.com "5-Yr Restated" financials, we can see the steady revenue growth, the steady earnings growth, and the relatively stable outstanding shares. Free cash is solidly positive and the balance sheet is strong. 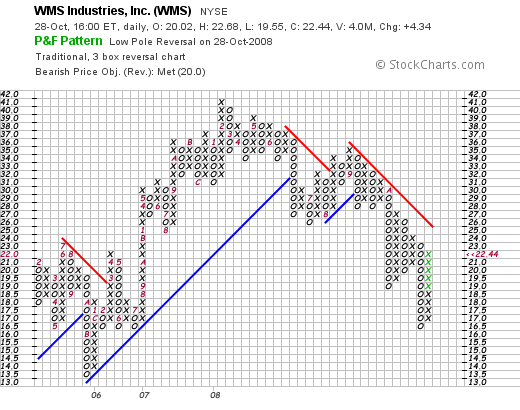 Looking at the "point & figure" chart on WMS from StockCharts.com, we can see what looks like a rather dismal chart to me! The stock failed to move higher in September, 2008, at the $36 level and has been trading under the 'resistance line' since. I would like to see this stock break through the $27 level to reaffirm the change in price momentum. The market has been tossing me wildly like a ship in the midst of a storm. I am learning to adapt---giving my last 5 holdings a larger leash before selling, and I am reducing the size of my replacement positions without changing my underlying strategy. I hope this works. I sold my National Oilwell Varco stock (NOV) and replaced that fifth position with WMS Industries (WMS), a gambling machine stock. I did so because of a strong quarter which exceeded expectations on revenue and earnings, a solid Morningstar.com report, and reasonable valuation. The chart however looks awful. I hope this approach works out! If you have any comments or questions, please feel free to leave them on the blog or email me at bobsadvicefortocks@lycos.com. Haemonetics (HAE) and BE Aerospace (BEAV) "Trading Transparency"
I must be a glutton for punishment. After having sold two of my positions earlier today, I started looking at the lists of top % gainers to see if I could find any new candidates for the portfolio, utilizing my new reduced investment size strategy I discussed in the previous entry. The first stock that appeared to fit my usual criteria for inclusion in my blog and my own trading portfolio was Haemonetics (HAE), and I purchased 50 shares at $51.54. This purchase was determined as 1/2 of the average size of my remaining positions. HAE closed at $52.38, up $2.79 or 5.63% on the day. Briefly, Haemonetics today reported 2nd quarter results for the quarter ended September 27, 2008. Revenue climbed 20% to $145.9 million, and earnings came in at $14.8 million or $.57/share up from $11.2 million or $.42/share last year. This exceeded expectations of profit of $.52/share on revenue of $136.3 million according to analysts polled by Thomson Reuters. The company also went ahead and raised guidance for fiscal 2009 to $2.38 to $2.44/share, up from prior guidance of $2.33 to $2.43/share. They also expect revenue growth of 12 to 14% from prior range of 10 to 13% expected revenue increases. The "5-Yr Restated" financials from Morningstar.com appear solid. The stock looked good to me and I added Haemonetics to my portfolio. With BEAV at $9.74, this would represent a loss of $(1.45) or (13)% since purchase. This is still above my (16)% loss limit with these last five holdings but just barely above a sale. What drove the stock to the top % gainers list (at least when I was looking at it) was the announcement of 3rd quarter results today with revenue climbing 37% to $587.8 million. Net income came in at $51.8 million or $.54/share up from $44.5 million or $.48/share last year. Analysts had been expecting earnings of $.53/share, so they exceeded analysts expectations. The Morningstar.com "5-Yr Restated" financials on BEAV appear relatively solid. It was my hunch that purchasing shares of an airplane interiors manufacturer might well be the benefit from the declining oil price. I hope that wasn't a stretch! Anyhow, that brings you up to date. 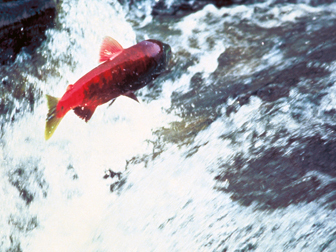 I shall continue to do the impossible, swim upstream against this bear market like the most dedicated of Salmon. Thanks so much for stopping by and sharing with me my own investing adventure. If you have any comments or questions, please feel free to leave them on the blog or email me at bobsadviceforstocks@lycos.com. Hello Friends! Thanks so much for stopping by and visiting my blog, Stock Picks Bob's Advice! As always, please remember that I am an amateur investor, so please remember to consult with your professional investment advisers prior to making any investment decisions based on infrmation on this website. One of my biggest goals from blogging about investing and sharing with all of you my decisions and trades is to develop a coherent approach to selecting stocks and managing my holdings in a fashion that preserves my gains, limits my losses, and adjusts my exposure to equities depending on the market environment. If you have read some of my latest posts, you will notice that my approach has struggled in this awful market environment. My investment strategy is to vary my holdings between 5 and 20 positions and to use sales on gains as signal to buy new positions (except if I am at my maximum of 20), and to use sales on losses as a signal of a poor market environment and simply to 'sit on my hands' with the proceeds of these sales unless I am at the minimum of 5 positions in which case, a 'buy' signal would be generated to keep me at my minimum equities exposure. It is in this 'under 5 positions' environment that my system has apparently broken down. To take serial (8)% losses only to replace these positions with new holdings that quickly accrue another loss is to compound my poor performance. And I have been busy compounding :(. So as of today I have implemented two changes that I would like to present and look forward to some of your comments. As I have alluded to recently, when I am at 6-20 positions, no changes will be made. However, at 5 or less, I shall first of all be more tolerant of losses. That is, while normally I sell holdings after an initial purchase at an (8)% loss, in this minimal position mode, I shall increase my tolerance to losses to (16)%. This is necessary due to the increased volatility of the entire market where the Dow routinely swings hundreds of points each trading day. The other refinement is regarding the size of positions. Up to this point, I really haven't had a consistent approach. Position sizing will affect all of my purchases whether below 5 or approaching 20. Again, I mentioned earlier that I would buy a '1/2 position' in the under 5 environment. To make this more exact, I will drop my fascination with buying shares divisible by 7 (to prepare me for my 1/7th sale at a gain), but rather if buying a holding to get my portfolio back to the 5 position minimum, I will determine the actual average size of my remaining holdings, and then purchase enough shares of the new position to equal 1/2 of that average. After getting back to 5 positions, assuming an appreciation of one of my holdings to my partial sale at a gain (30% appreciation over the initial purchase price) I shall continue to sell 1/7th of my holding, and then add a position equal to the average size of my existing holdings. This will deal with two situations. First in a poor environment as holdings are sold sequentially at less than 5 positions, I shall continue to add new positions that are smaller in size each time---equalling in size to 1/2 of the average of the current holdings. As the market improves in tone, I shall add new positions equal to the average holding size, which assuming market improvements, will also increase in size over time. Will this work? I am not sure. However, it has to be better than my current approach. Rules are no guarantees to success, but thinking about trading rules ahead of time is more likely to provide me guidance better than 'from the hip' trading decisions. I will keep you posted. Meanwhile, if you have any comments or questions, please feel free to leave them on the blog or email me at bobsadviceforstocks@lycos.com. Covance (CVD) and Imperial Oil (IMO) "Trading Transparency"
Clearly my investment approach shows the greatest weakness on severe contractions and large degrees of volatility in the market. While trying to step aside and then re-enter equities, I feel like I have been getting my face slammed in a revolving door over and over again. I may have gotten smacked once more :(. As I discussed previously, I have adjusted my own trading system to reduce the number of trades in a very down market by increasing my loss tolerance to (16)% losses on my last five positions. Even this apparently is not enough. Earlier today I sold two of my five remaining positions. I sold my 102 shares of Covance (CVD), which has been behaving particularly weak this past week, at $48.23/share. These shares had been acquired 4/9/07 at a cost basis per share of $62.61. Thus, I had managed to incur a loss of $(14.38)/share or (23)% since purchase. Out they went. I also unloaded my recently acquired shares of Imperial Oil (IMO) at $29.31. These shares were just acquired 10/20/08 at a cost basis per share of $35.17. Thus, I had quickly incurred a loss of $(5.86)/share or (16.7)% since purchase. So I am now down to three positions: Graham (GHM), National Oilwell Varco (NOV), and Rollins (ROL). I shall try to hang onto those unless they too incur a (16)% loss. And on any new positions, I shall try to limit their size to 1/2 of the average size of the remaining positions. In this way, my committments to the market should diminish if I tend to be 'whip-sawed' frequently into buying and then selling positions as the market gyrates.